For over 30 years HomeCrest has manufactured quality cabinetry at affordable prices. The main production facility is located in north central Indiana, with a components plant in Clinton, Tennessee. Our philosophy to provide individuality and style for every stage of your life has helped the company to become one of the premier cabinet manufacturers in the nation. Ask 50 people what their preference in cabinets would be and you'll likely get 50 different answers. HomeCrest understands. That's why we build cabinets with over 150 style/finish combinations and complement them with a variety of convenience cabinets, moldings, trim, hardware and accessories. And all are offered in a broad range of pricing. 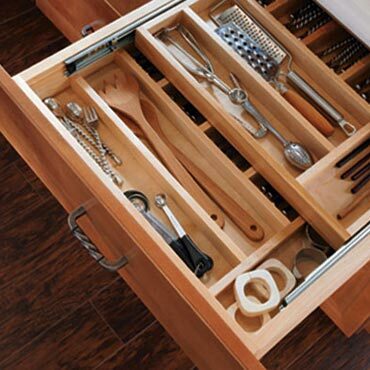 Whether you are building a new home or remodeling an existing home, you want your cabinetry to fit perfectly. If you have special needs - a cabinet just a bit wider or just a bit deeper - HomeCrest's Custom Choice department will help. Using standard doors and drawer fronts, HomeCrest can help you create that perfect fit - all within standard delivery time. Your custom cabinet arrives with your standard cabinets! Superior product quality. Comprehensive warranty coverage. Responsive customer service. Fast turnaround on standard and Custom Choice Cabinetry orders. That's what we've provided builders, dealers and consumers alike for over 30 years. So the question really isn't "Why HomeCrest?" It's "Why search anywhere else?"